The community life of Santhals center in his village, and is so organized as to make common action inevitable in social economic and religious affairs. 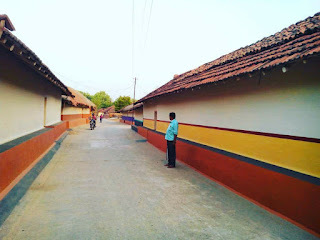 The houses are built on either side of the village street, which leaves a good space for two bullock carts to pass each other. The houses set closer together and have their main door opening on to the village street. Each house is responsible for the state of the road outside. In that way, it becomes a moral responsibility in a traditional way to which they take care of the outside premises clean and maintained. And like many things, this also become an integral part of the Village. Santhals are also well known for their artistic creativity. Evidently, we can find this in their daily life skills, Like the way they decorate their house, painting of wall that too by just using of natural colour which is found in soil and some limestones. 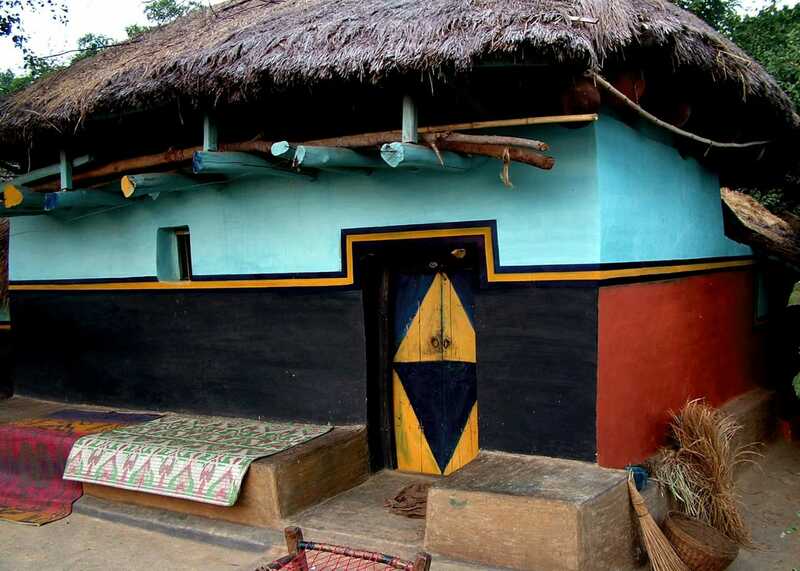 Santhal houses are built of very basic things. Basically, it consists of soil mixed up with the husk of rice, bamboo and Sal wood. Earlier time, the thatching of the roof was done by using haystack, but nowadays tiles are being used for this purpose instead. A view from courtyard showing the interior look of Santal house/(Bengal). Each house in the village has their own taste of designing and decorating the walls. Historically, on a larger scale, the formation of the village started with two or three brothers who came there first and later on, with many people and family came up to join and live closely, formed the village. Initially, it was those brothers or family who first came and cleaned the bushes nearby, collated the land and set it for cultivation and the cultivable land was divided equally. In recognition of their valuable hard work and thought, people assumed Eldest brother among them to be the ‘Majhi’ of the village to lead and perform for the benefit of the community. Majhi is considered as the headman of the village who speaks on behalf of them. ‘Gosane’ is a kind of small hut which is built just outside to the Majhi’s house. A stone is placed in ‘Gosane’ in his memory when he passed away. The number of stone tell us about how old is that village. Jog Majhi ( a young person, to assist Majhi ). Kudam Naike ( Assistant to village priest ). Atu Mone Hor and Godet ( Any five person from village at any instance and a person appoint for errand ). If you're interested to know more about Santal's 'Social Organisation', you should give a look to this article: 'Self Rule of Santhal Community'. A Santhal village doesn’t get completed by just having a ‘Majhi’ and houses around. In spite of having a well organized social system, it has to have some organizational unit of spiritual belief also. The one of such belief is, they make ‘Jaherthan’ which is the sacred grove of ‘Sal’ tree where villagers annually gather and perform their community worship to Nature. Also, they make a separate wide space within the village where people gather to enjoy by singing some Santali Folksong and Folkdance, this place is called ‘Akhra’ a commonplace to villagers, where when needed village meeting also is held. In addition to all these social structures of the village, spiritual belief is also the utmost priorities of the village. From the beginning of the formation of the village, they regard their village by calling to ancestral spirits, they ask ‘Marangburu’ the supreme spirit of the universe to help and support them to establish the all things well to them, to keep the disease away from the village. And they also acknowledge them for blessing the village with all nearby thing such as river, mountain, and forest. And this way, villagers find the spiritual values to the river, mountain, and forest.